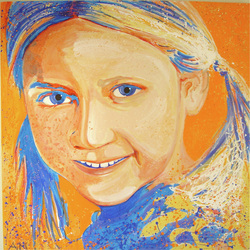 NOW CUSTOM KIDS PORTRAITS AVAILABLE! Acrylic on box canvas, no frame needed! this style is very fun, bright and bold and abstract- just POP ART! all I need is your favorite snap shot of your child via email! please call me for a quote today!